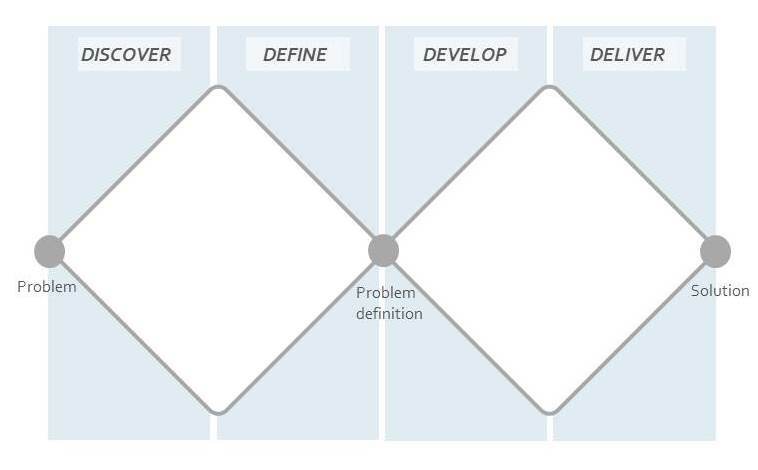 A process model inspired by the professional design process that entails emphasis on problem analysis as the basis for creating a solution for an external client. The model is particularly suitable for structuring a course with external collaboration and user involvement in the development of solutions. Double Diamond is a process model created by Design Council, a British organization, in 2005. The model provides a graphic representation of a design process. Its development was based on case studies gathered from the design departments at 11 global firms. Four generic stages are identified and described in this process model. The model presents four main stages across two adjacent diamonds. As illustrated in the Double Diamond model’s first diamond, the problematisation and understanding of a problem are equally important. Discover –identify, research and understand the initial problem. Define – limit and define a clear problem to be solved. Develop – focus on and develop a solution. Deliver – test and evaluate, ready the concept for production and launch. Read about each of the four stages below. In the links to the more detailed descriptions, each stage is accompanied by relevant methods that can be used to support your process design. An example of Double Diamond as process model during a three-week summer school, PLEN, SCIENCE, UCPH. The project begins with an idea or inspiration that often stems from some type of discovery process. Usually the starting point for most projects is a preliminary idea or inspiration. The discover phase is characterised by divergent thinking as a team opens a solution space and investigate a broad range of ideas and opportunities. Questions are asked, hypotheses researched and problem statements are formulated and based upon the research and analysis of user needs, market data, tendencies and other sources of information. This stage involves the evaluation and selection of ideas. Discover stage results are analysed, developed and detailed, while ideas for solutions are prototyped and pitched. During the first part of the Discovery stage, a team should maintain a broad perspective – a ‘divergent thinking’ approach – in order to identify a problem, user need or technological opportunity that can lead to the development of a new product or service. The Define stage is characterised by convergent thinking. In it, a combination of ideas or directions identified during the Discover stage is analysed and synthesised into a written brief that includes all new product or service development activities. Important activities during this stage are: the preliminary idea and project development, project management, negotiation and approval of project goals. During the Develop stage, the project is approved (by a case company, for example) for further development and one or more of the concepts is developed further. The team refines one or more of the concepts that will solve the problem or user need identified during the Discover and Define stages. Design methods deployed during this stage include brainstorming, visualisation, prototyping, testing and scenario development. The methods resemble those from the Define stage, but focus more on realisation. Important activities during this stage are: interdisciplinary and external collaboration, development methods and tests. During the Deliver stage of the Double Diamond model, the process revolves around the final concept, final testing, production and launch. The product or service developed to solve a specific problem during the Discovery stage has reached completion. Important activities at this stage are: final testing, approval, launch and evaluation.